Choosing the right Formwork ? SitePlant has a large range of used Formwork available for immediate purchase. SitePlant sells a wide range of used Plant & Equipment. Remember to check for new listings ! 2008 Model Geda 2 tonne Hoist being sold with approximately 15.0m of Twin Mast Sections (total 30.0m) including five Gate Sets. 40 packs of used F22 6x4 Big River Formply Sheets being sold ex yard in Brisbane. Sale Price (per pack of 40) is $ 859.00 + gst. These Slims are being sold ex yard in Brisbane. This Holland Formwork Hoist was purchased from Consep in Sydney 4 - 5 years ago for use on the one project. It has been in storage since. Sale stock includes a large quantity of 2.4m & 5.4m Aluminium Ladders in near new condition. These Ladders are located in Brisbane. 150 sets of 1.8m V-Shore Frames available for purchase in NSW. Package includes 26 of 2.6m-4.4m & 10 of 2.2m-4.2m. These 2.5m length Multiscaff Aluminium Mobile Scaffold Towers are in new (unused) condition.They are being sold at below cost to clear. We can help you to find a Supplier who has the Formwork and Scaffolding or other Plant & Equipment that you need. Perhaps you have equipment that you would like to sell? Finding time to do this might be difficult. SitePlant has a large network and the product knowledge that enables us to do this work for you. It would be a pleasure to work with you and a greater pleasure to have you as a valued client. SitePlant can help you to Purchase or Sell the full range of Plant and Equipment that is typically used in the Formwork & Scaffolding Industry. We can also offer guidance to help you make informed decisions about the types of equipment that may suit your next project. 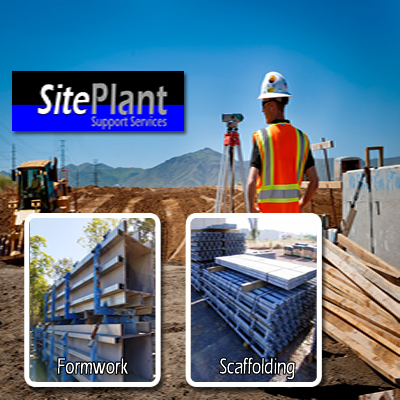 SitePlant networks with and provides used equipment solutions to Formwork, Scaffolding and Building Contractors throughout Australia and New Zealand. We are a leading Supplier of used Formwork and Scaffolding Equipment throughout the Asia-Pacific Region. Buying used Concrete Formwork and Scaffolding Equipment has never been easier ! Table Formwork, V-Shore Frames, Brooker Frames, Pafili Frames, Super Frames, Scaffolding, Ringlock, Modular, Cuplock, Layher, Rapidshor, Hoists, Column Forms, Concreting Machines & Equipment, Safety Screens, Climbing Systems, Multiprops, Wall Formwork, PERI Formwork, RMD Formwork, Acrow Formwork, Doka Formwork, Hunnebeck Formwork, Falsework, and more. SitePlant Support Services : matching Buyers with Sellers.